This stunning full-colour book is 559 pages, which is longer than the V20 rulebook itself! 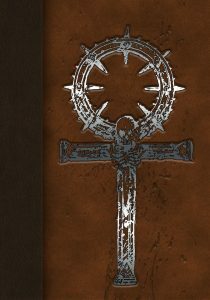 Those pages are bursting to overflowing with references to characters, locations, and events spanning the entire 27-year history of Vampire: The Masquerade, including material from the VTM Redemption and VTM Bloodlines PC games. In two chapters, Beckett returns to LA following the events of Bloodlines. Locations he visits include the Santa Monica beach, the newly-reopened Ocean View Hotel, the New Asylum club, and the Hallowbrook Hotel. Some familiar names include Anarch leader Rodriguez, Damsel, Smiling Jack, and Mitnick. Side references to stuff like LaCroix, Strauss, and the Golden Temple. If you're a Redemption fan, elsewhere in the book Beckett talks with "Catherine Weiss" (Ecaterina the Wise) and Christof. We poured a lot into this book, and really hope you like it. Re: Now Available: Beckett's Jyhad Diary! Well, I've skimmed through the book just to see how connected it is to the videogame, turns out not so much. If I remember correctly VTMB was released posthumously to oWoD, yet the ingame continuity was established as canon, except it was never mentioned in any of the source material, because, y'know, oWoD was killed. The book seemed to me like it was a bit too epistolary (where are my tables?) and too, ehh... narrative driven? Lot's of characters make appearances, and a pretty extensive knowledge of metaplot isrequired to fully enjoy the book. I'm not sure how useful it's to someone who actually runs the games, but both people interested in metaplot or WoD fiction will most likely enjoy this book. The art is alright too. Whose idea was it to name Rodriguez "Armando"? IIRC at one stage of the writing there was uncertainty as to how far we could delve into using Bloodlines characters, since they're Activision's property. One compromise was including "Armando Rodriguez" who may or may not be the same person as Nines. Armando is the first name of the actor who played Nines, so it felt right.